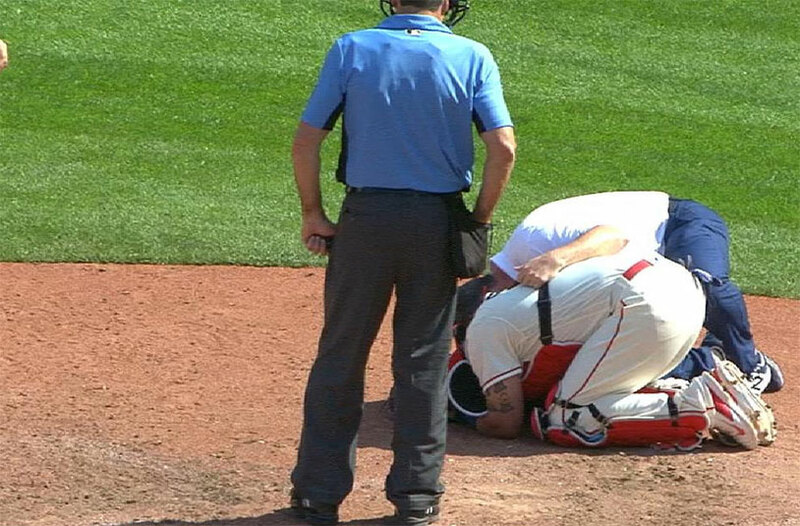 Last week we reported on Cardinals player Yadier Molina taking a tipped ball to the groin so hard that he had to be hospitalized, and the club is taking the incident very seriously. So seriously, in fact, that they’ve turned to a Ball Report favorite – Jeremiah Raber, the creator of the Nutshellz bulletproof jockstrap. Regular readers of the site may remember we interviewed Raber when he was promoting the Kickstarter for his product, which was inspired by a brutal groin shot he saw in an MMA fight. Raber was so confident about the ability of the Nutshellz to withstand even the strongest impact that he had a cohort shoot him in the groin while he wore one. Now that’s dedication to your product. A long-time Cardinals fan, Raber approached the team after the Molina incident and told them that the Orioles had already equipped their catching staff with the cups and he’d cut them a deal. Now that the team is equipped with the Kevlar, carbon fibers and aero-space epoxy groin protection, hopefully we won’t see a repeat of Molina’s injury any time soon. Good on you, Jeremiah. It’s great to see you growing your business, even if it had to come at the price of a player’s gonads. Read more at The Athletic.